Patient flow and feedback are critical to improving patient satisfaction and maximizing reimbursement. Tracking the patient experience from door-to-discharge and post-visit through online reputation management are key factors for patient acquisition and retention. PatientTrak’s cloud-based visibility solutions including Visit Flow, Online Reputation and Patient Engagement are used by healthcare organizations to reduce wait times, build their brand, and improve patient satisfaction. We drive your patient satisfaction through the engagement cycle. Eliminate white boards, paper tracking and telephone status updates with real-time, cloud-based patient tracking. Improve registration with a patient check-in system that allows patients to sign-in on an easy-to-use touch screen kiosk or iPad. Display your current wait time and enable patient check-in from your website. Great for urgent care and other immediate care clinics. PatientTrak is HL7 compatible and integrates to your EMR, scheduling, ADT, or other practice management systems to reduce data entry. Improve review volume and star ratings through encouraging advocates of your practice and providers to share their thoughts with others. Send HIPAA compliant, fully customized patient satisfaction surveys automatically for both providers and locations. Understand who is saying what where through our monitoring service which covers high volume patient review sites. Publish your internal or CAHPS surveys to your own physician directory pages and improve your rankings and search results. Proactively update staff, patients and waiting family members with text messages. Reduce waiting room anxiety and improve patient satisfaction. Turn consumers into patients and keep them coming back using our innovative platform and automated engagement tools. PatientTrak helps you reduce wait time by up to 70% and keeps your staff efficient. PatientTrak brings visibility to your patient flow which cuts down calls between staff and eliminates the need to locate patients. Wait and cycle time are significantly reduced. Increasing your visibility to the patient flow saves significant staff time that can be used for other more important purposes. Reducing patient cycle time increases capacity and potential revenue. 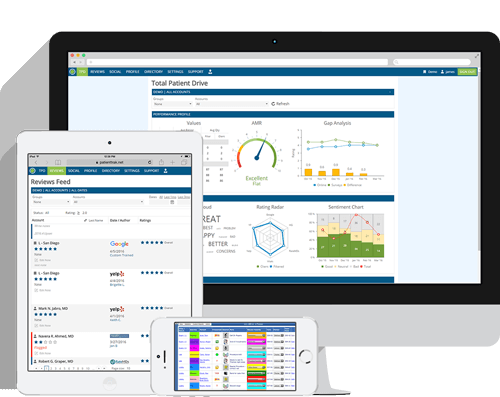 Using PatientTrak allows you to monitor and measure patient feedback, improving operations and your brand. Using both online reviews and surveys we provide a complete picture of patient satisfaction.